60 years after Brown v. Board of Education, how racially balanced are America’s public schools? It’s been more than 60 years since the Supreme Court, in Brown v. Board of Education, ruled “separate but equal” schools unconstitutional. In that time, school populations have diversified, thanks in large part to an increase in the numbers of Hispanic and Asian students attending U.S. schools. But how closely do America’s traditional public and charter schools look like the communities they serve? And if schools’ student bodies don’t reflect their neighborhoods’ racial makeup, how come? In “Balancing Act: Schools, Neighborhoods, and Racial Imbalance” (PDF), Grover J. “Russ” Whitehurst, Richard V. Reeves, Nathan Joo, and Pete Rodrigue examine the share of white, black, and Hispanic students at 86,109 public schools—both traditional and charters—across the country and identify schools whose racial imbalance with respect to their surrounding neighborhoods makes them ‘outliers’ within their states. The analysis finds that though most schools are relatively similar to their surrounding neighborhoods in terms of racial makeup for white, black, and Hispanic students, there’s a lot of variation between school districts and states. Charter schools, in particular, display greater racial imbalances than traditional public schools and are on average 6 percent more black than their neighborhoods. When compared to traditional public schools, charter schools are on average approximately 14 percent more black, 22 percent less white, and 8 percent more Hispanic. Want to see how your school compares to other schools within your district? Search for it in a new interactive, or read on for more top-level findings. The authors find that many schools are similar, in terms of their racial composition, to the neighborhoods in which they are located. The average U.S. public school (including charter and magnet schools) is 2.6 percent less white, 1.8 percent more black, and 0.9 percent more Hispanic than its surrounding neighborhood. Though most schools are similar to their surrounding neighborhoods, approximately one-third are outliers. Further, schools that qualify as outliers tend to have either an overrepresentation of black and Hispanic students, or an underrepresentation of white students. Then they determined whether a school is an outlier for each racial category (white, black, Hispanic) based on the degree to which the racial imbalance between a school and its neighborhood is substantially outside its own state’s pattern of school-neighborhood differences, assuming a normal distribution. This means there are some schools—in Washington, D.C. or Mississippi, for instance—where the black or white student populations are underrepresented or overrepresented by as much as 30 percent compared to their neighborhoods, but aren’t classified as an outlier. That’s because the threshold for determining outliers varies by state, and some states or districts—like D.C. or Mississippi—have higher thresholds because the state’s range of imbalance scores is wider. Charters show more racial imbalance, especially in terms of their black student populations. But why? Charter schools tend to have an overrepresentation of black students compared to their surrounding neighborhoods. In contrast, Hispanics are underrepresented in charter schools. So why is this? The most obvious explanation is that charters allow students to attend schools outside of their neighborhoods. But as the authors argue, it’s a bit more complicated than that. The authors find no substantial correlation between the quality of statewide charter school laws and racial imbalance. At the same time, they don’t find anything beyond a modest correlational relationship between the degree to which charter schools may act as substitutes to traditional public schools (based off of geographic proximity) and charter school racial imbalance. 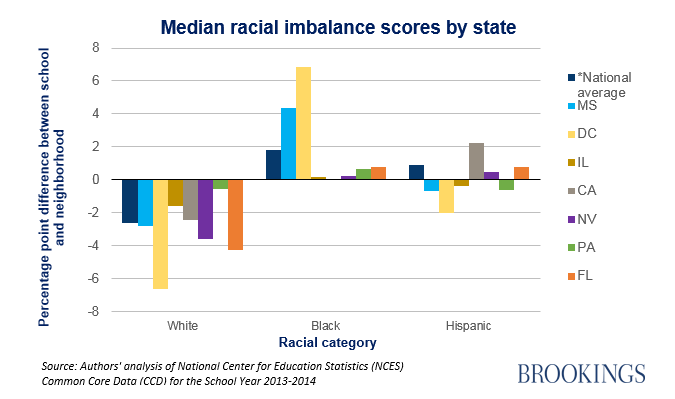 There is also significant state-level variation in the racial imbalance of schools. In the regions with higher minority concentration, the South (for black Americans) and the West (for Hispanic Americans), the chances of seeing larger racial imbalances in public schools increases. The authors aren’t able to conclude whether this is because more minority density translates into more opportunity for minority populations to freely form more homogenous schools or because it translates into increased propensity for white-flight from the school system. For some school districts across the country, the way district lines have been drawn masks the extent to which schools don’t look like their surrounding neighborhoods in terms of race. In Long Island, for example, school districts are quite small (the island is 1,400 square miles and has 125 districts, with the typical district having only one high school). When the authors relax the boundaries of their analysis and ignore district lines (incorporating schools outside of the school district, but within the 2-mile neighborhood radius), they find the racial imbalance in some of these “gerrymandered” school districts grows dramatically. For more on how gerrymandered districts affect the racial makeup of some U.S. schools, read more on the Social Mobility Memos blog. School-level data on racial imbalances can be valuable for a number of reasons, especially for local policymakers trying to understand the effect their policies may have on the racial makeup of local schools. Many localities such as Wake County, Boston, Charlotte, and Seattle have ended or substantially curtailed their efforts at K-12 school integration. Since 2000, at least 71 communities across the country have attempted to create new, smaller school districts (47 have been successful). Some fear such action could lead to greater segregation in public schools. The authors emphasize caution, however, against drawing overly broad conclusions. The fact a school is more black than its surrounding neighborhood may be the result of intentional policy and is not necessarily good or bad. And when it comes to charters, the authors find it’s equally likely that they could lead to a deepening of segregation (in part by allowing for black students and white students to choose schools in which students of their race dominate enrollment) or they could reduce it and lead to greater equity (by loosening the connection between neighborhood and school). The authors conclude that though recent history has seen a decrease in policy to encourage integration, it’s still possible to increase school diversity. Read the full paper to learn more (PDF).